If every place was the same, they would be no need to travel, but it would be very crowded here. Or would it be there? Terroir is a French term and it refers to the specificity of place. Terroir Includes all those environmental conditions that lend themselves toward making a wine with a different flavor nuance. The soil, climate, topography – really all and every of the environmental factors that contribute to the vine’s production. That is why the French (and others) do not name wine after the grape, but rather its place of origin. The grape we know as Sauvignon Blanc may be labeled, if French, as Sancerre, Graves, Pouilly Fume, Pessac-Leognan, Entre-Deux-Mere … well, you get the point. When it comes to Albarino, let’s assume that if Spain is the capital of wine for you, Rias Baixas is the capital of Albarino. It is from that sense of place, unlike any other on the planet, that defines Albarino: a white wine that is crisp, is born for summer’s enjoyment, is food friendly, and may be compared to Sauvignon Blanc, but is different – of course – because it is a different grape and makes a different wine. Albarino is so well received, that while not an officially recognized “international;” grape, it is made worldwide. The best, however, always has and remains being that made from Rias Biaxis on Spain’s NW coast. The Galician coast is exposed to the Atlantic Ocean and benefits from a cool maritime climate. Summer daytime temperatures (24 degrees C) average 74 degrees F. Winters are mild. The whole of the region is known as “Green Spain” because conditions are cooler and wetter than otherwise in Spain, resembling Ireland with its rocky coasts and hillsides covered in green. 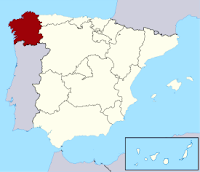 The best-known wines of Galicia come from Rias Baixas, a single D.O. broken up into five non-contiguous areas. Soil throughout Rias Baixas is granite bedrock and alluvial topsoil with concentrations of sand, silt and mineral providing for excellent drainage. Mild temperatures throughout summer allow grapes to ripen slowly assuring a wine that retains acidity and makes Albarino extremely food friendly. Atlantic. Vineyards are located 6.2 miles from the ocean and 2.1 miles from the river and on terraced vineyards planted on the slope of Mount Galelo about mid-point at 200-350 meters (656-1148 feet) above sea level. This well thought out location protects the vines from the mists and excess moisture of the valley floor while also sheltering them from the extreme cold at the summit. With a southerly aspect, vines absorb excellent sunshine, while ripening slowly and developing phenolic character (otherwise known as “yummy flavonoids”). When it comes to yummy flavonoids, this Albarino based blend excels in both taste and value. Deep lemon in the glass, the nose is enticing and complex: You’ll put off immediately tasting the wine just to continue to enjoy its aromas. Honeysuckle, lemon crème (as in a meringue pie) orange peel, lychee, and an undertone of lavender. The texture is creamy. Citrus is initially soft but builds intensity throughout while never becoming awkward. This is a refined and graceful approach with everything in balance. On the palate, expect to enjoy a mélange of apricot, lychee, and pineapple. A dry wine, yet creamy and rich, it finishes cleanly. Tasting it again over a span of two hours, I enjoyed added notes of orange as the wine warmed in the glass. Notes of dried green tea. And most surprising: banana! The finish is medium to medium plus. There’s the saying, “If it grows together, it goes together.” And in Galicia, sea food rules. I paired this wine with Spanish cheeses and olives. Grilled vegetables are an excellent companion. A platter of shellfish with grilled oranges went excellently. Before you consider that splurging on shellfish would kill the budget, consider the ARP for this wine is just $13-$14. Then consider the care that went into site selection for these Albarino wines of Rias Baixas. It’s an opportunity to enjoy the best of the varietal at budget friendly pricing: a gift of terroir. Caino contributes citrus freshness to the blend along with mineral notes, tropical flavors and good structure. Loureiro offers aromas of orange and acacia blossom. Each varietal is harvested separately and matured over their lees, after fermentation, for 120 days (which explains the wine’s texture).